Dear Diary Chapter 1 is complete! Before I get into this months Chapter, I’d like to say a quick Thank You for all the kind messages about this quilt and why your making it! Means a lot!! I’m happy to have you along and also thrilled to see so many of you from all over the globe! 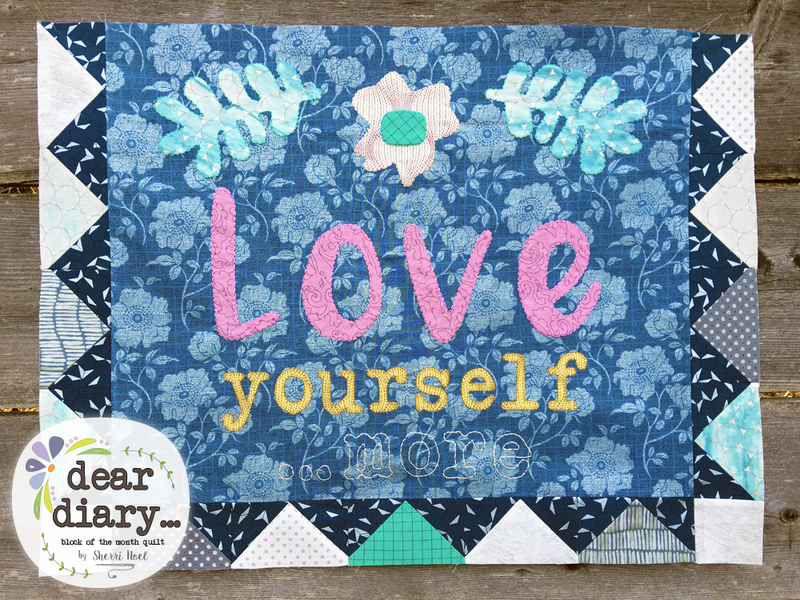 Love yourself … more seemed like a good place to begin with this quilt. Every month and each text block will have little sayings or quotes… Reminders of living a good life, self reflection, positive reminders, goal setting, and inspirational suggestions. To me the Chapter 1 quote represents slowing down a little and making time for ME – something women (in general) don’t do enough of. We wear so many hats and do so much for others it’s important to take back a little time and give ourselves a little love. For this months chapter I used the needle-turn applique technique for the applique shapes and the Love text. Cut out your letters, place them right side up on applique fabric & trace. FINGER PRESS on the lines and trim the seam allowance as you sew, so fraying isn’t an issue. 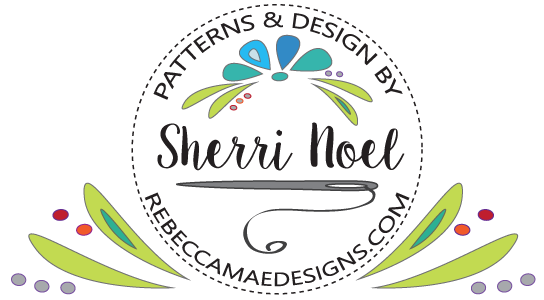 I decided to add some decorative stitching around my needle-turned applique for fun. If you like this look I have a pearl cotton bundle to coordinate with the colors I’m using listed in MY SHOP. I used the fusible method for ‘yourself’ using a blanket stitch by machine. My fusible of choice for this is Steam-a-Seam Lite 2 by the Warm Company. It doesn’t gum my sewing machine needle and what I really like is once I’ve removed the paper backing I can stick my letters in place temporarily and still move them around before I press them in place. Don’t forget you can use your ruler to keep everything straight! And for the final text (… more) I traced the letters with a removable marker and stitched on the lines with pearl cotton, which made it super quick and easy. It might not stand out like the applique lettering but I like that it’s just a little whisper of a word. Thanks for following along! See you next month! If you like this post – please pin and share! where do we go to print out the pattern ? I just ordered the pattern today and I can’t wait to start! Greetings from Fairview, Texas. Can’t wait to get started! Loved doing this block. Now I think I’ll go back & add the decorative stitching like you did!